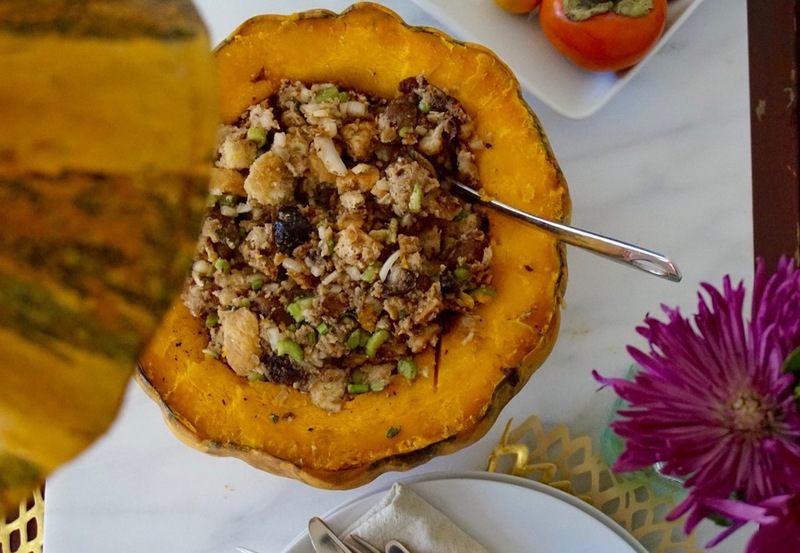 This favorite Stuffed Pumpkin Dressing for Thanksgiving is a creative way to serve up a savory staple side dish this holiday! 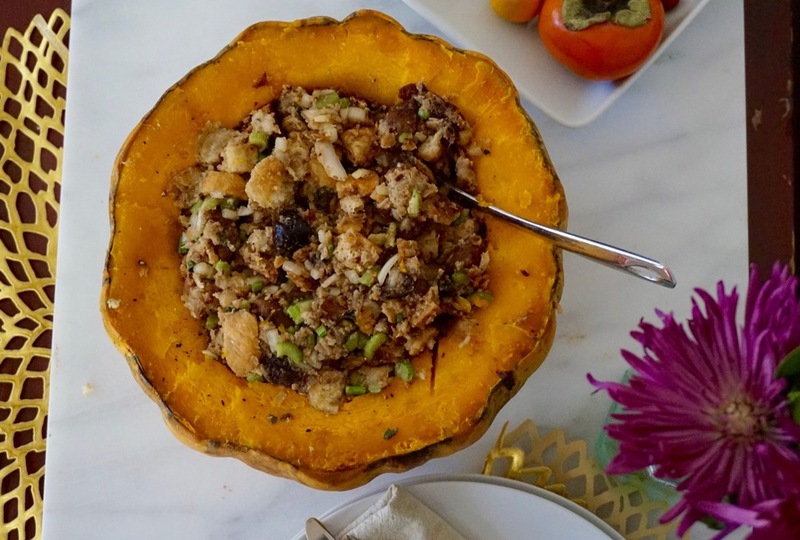 No matter how you celebrate Thanksgiving, chances are there is some bready, savory stuffing on your holiday agenda. 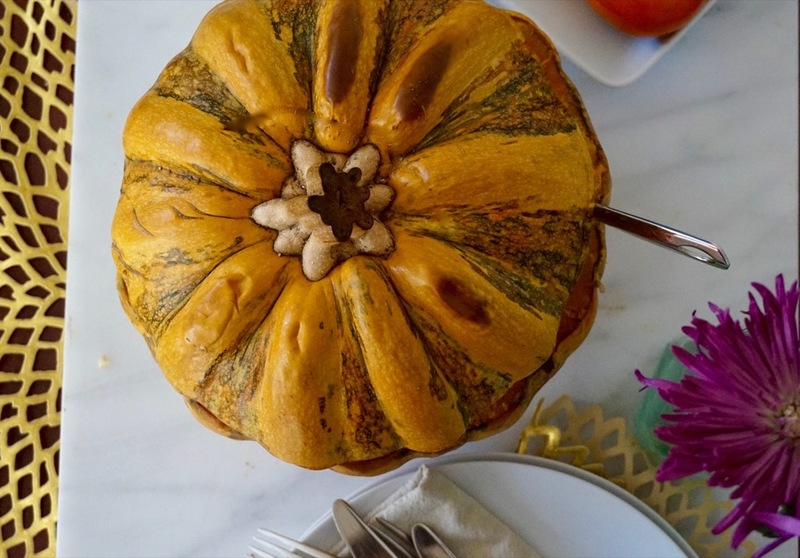 This straightforward, classic dressing -baked in a pumpkin- is a family favorite on our in-house chef's table; she loves it because its a guaranteed way to get extra pumpkin into her Turkey Day feast, plus it's a creative and unexpected way to serve up a staple side dish! A couple of notes about the recipe itself: if you aren't keen on both apricots and plums, you could substitute dates or figs. Our Chef, Lentine, likes to use whole-grain bread but any bread will do. When choosing a pumpkin, use a medium-sized white or buff skinned pumpkin, or a large kabocha squash (ask your grocer for a good eating pumpkin!) Lastly, the recipe takes a couple of easy preparatory steps which are best completed the day before you want to bake the stuffing. That way, you can assemble and bake just in time to serve up the turkey! Cut off and reserve a lid. The dressing will be easier to serve later if you score the pumpkin all the way around with a knife, about 1-2 inches down the side of the pumpkin from the stem. Then slice the top right off. (See the first image above for reference.) Then, scoop out all of the seeds and fibers. Put an inch or two of water in a large pot. Place the pumpkin, cut side down, in the water, cap wedged in near it. Bring to boil over high heat. Cover tightly and steam for 10-15 minutes to precook it slightly. Then, remove the pot from the heat and let cool. When the pumpkin is cool, remove the pumpkin from the pot. Since the pumpkin will be eaten with the stuffing, we like to season the inside by rubbing salt, pepper, a little tamari and brown sugar, into the exposed interior of the pumpkin flesh. Now, you're ready to start making the stuffing! Place the apricots and plums in a small, heatproof bowl. Place the apple juice in a small saucepan over high heat and bring to a boil. Immediately, pour the juice over the dried fruit. Let stand for at least 2 hours (overnight is fine too.) Drain the dried fruit, reserving both the fruit and the soaking liquid. Coarsely chop the fruit and set aside. Preheat the oven to 375F degrees, then turn it down to 200F degrees. Next, prepare the bread crumbs. Slice the bread into small cubes. Place the cubes on two baking sheets in the preheated oven and bake, stirring often, until the bread is hard, crunchy and dry all the way through but not browned. This will take 45-60 minutes, but we advise setting the timer at 20 minute intervals to help you check the toast! Pull the sheet pans from the oven and let the bread cool. Once cool enough to handle, crumble the bread into a large bowl. 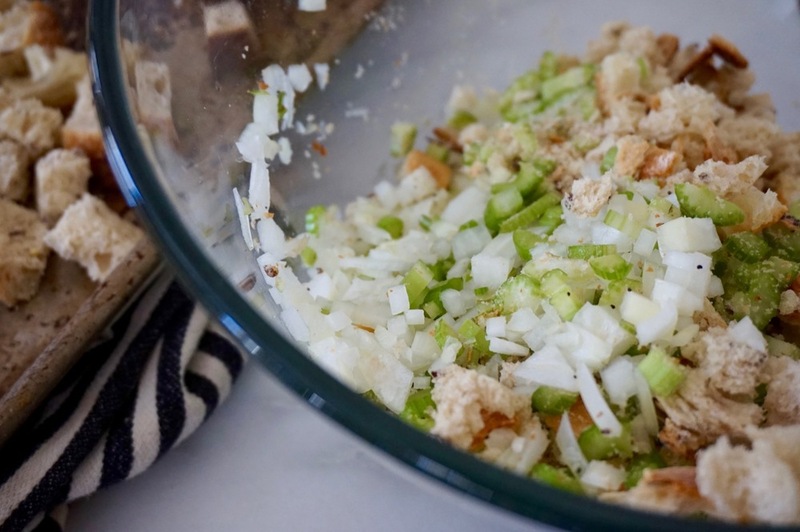 Add the onion and leafy celery and toss to combine. Measure the sage (starting with the a smaller amount) into your hands and rub the leaves back and forth in your palms until they crumble (this releases the volatile essential oils). Add the sage to the bread mixture. Pour the melted butter over the mixture and toss well to combine. Add the soaked dried fruit and toss again. The stuffing should still be dry. Begin adding the the vegetable stock and the reserved fruit soaking liquid, employing more stock than juice and adding just enough liquid to make the dressing moist, but not soggy. Keep tossing, adding stock as needed. Next, add tamari, starting with about 1 tablespoon. Add plenty of salt and pepper and then taste: more salt or pepper? More sage, maybe? This is also the point at which you can add a little of the dried basil and oregano if you like. The stuffing can be prepared up to this point and stored, covered and refrigerated, overnight. On the day you plan to stuff the pumpkin and bake it, preheat the oven to 375F degrees. 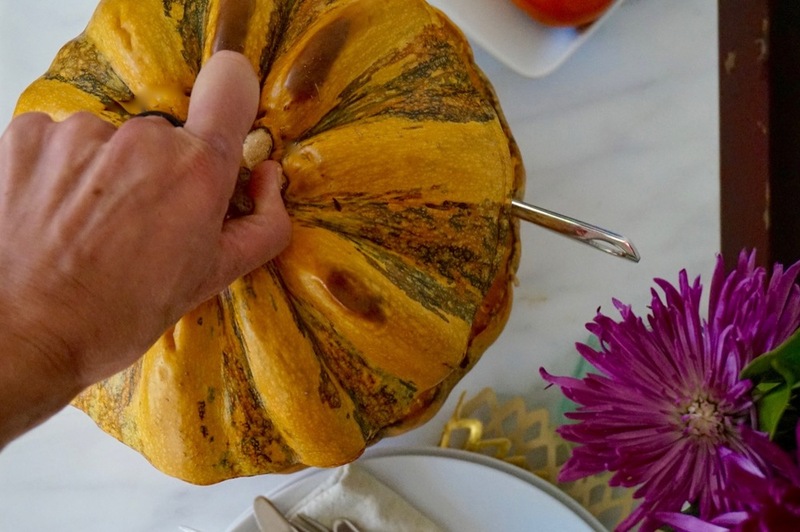 Prepare a baking pan (large enough to accommodate the entire pumpkin) with cooking spray or a little bit of olive oil. Stuff the dressing into the cavity of the prepared pumpkin, topping with the pumpkin's cap. Place the stuffed pumpkin in the prepared baking dish. Place in the preheated oven and bake until the pumpkin is slightly brown and looks a bit collapsed in on itself, about 40 minutes. Serve whole, at the table with all of your friends, family and other fixings!